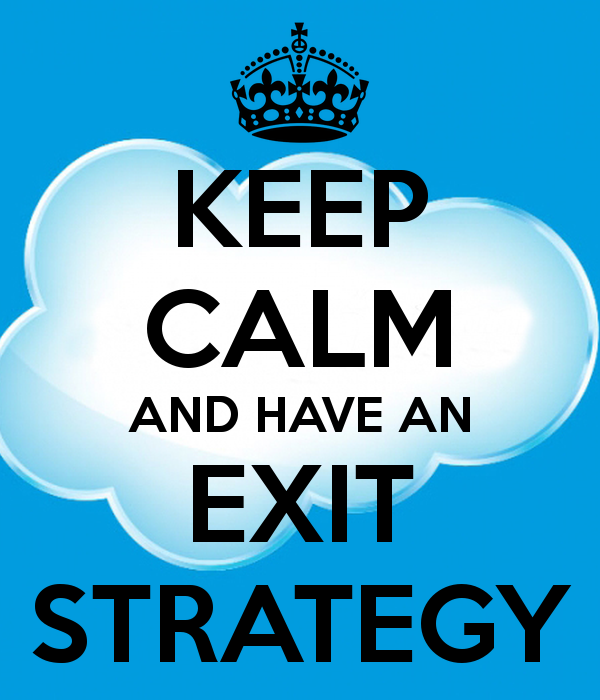 Exit Strategy now for the same protection of your greatest asset? Selling your business can be an organized process where each step maximizes profit and your advance preparation expedites the sale, or it can be a dismal failure full of gut wrenching interactions and tremendous amounts of your money left on the table at the close. Fortunately the choice is yours. A good Exit Strategy starts with simple awareness of the process of selling and can be implemented in advance in your day to day activities with little additional effort. Thinking of the sale of your business in health terms, consider the sale with no preparation as last minute surgery with no anesthesia, and a properly done Exit Strategy as preventative medicine that will keep you out of the pain and cost of surgery. Your Exit Strategy begins with awareness that one day you will sell your business. Reasons vary with each business owner and can be as simple as boredom with your own company that you have built, to complex issues such as health or divorce. Only you know when it is time for you to sell. However having implemented a written Exit Strategy will assure maximum profit at the sale and great peace of mind should you be selling under less favorable circumstances such as the mental duress of a downturn in business or poor health. You pay for insurance to protect your assets, why not implement an Exit Strategy now for the same protection of your greatest asset? Once the decision to sell is made, the contacting of a business broker to discuss the market conditions and the various options you have to sell your business is imperative. Most businesses are sold to other individuals through a broker who facilitates the transaction, working in your best interest. Buyers can be entrepreneurs that have the same zeal you had when you started your business or industry players that will purchase your business to expand or enhance theirs. A qualified business broker can be instrumental in helping you write a good Exit Strategy that encompasses the sale scenario viewed from every angle. You will want to discuss a Buy/Sell Agreement with your business broker and other professionals like your attorney and CPA. Existing agreements with partners, stockholders, landlords, and others will be examined to ensure your goals, expectations, and terms and conditions of sale are not remedied void and as few as possible conflicts arise during the due diligence process. Due Diligence is the process of verifying the accuracy of the assertions made regarding your business. View your Exit Strategy from the viewpoint of a buyer. What would you be looking at and for if you were to buy your business? Do your P&L’s match your Balance Sheets and Tax Returns? Imagine the lack of confidence you would have to move forward as a buyer of your business if discrepancies arose in your financial documents at the due diligence stage of the sale. What about the physical state of your facility ? If you were the buyer would you want to walk in to a facility that needed immediate attention or a facility that was clearly neat, clean, and organized, allowing you to transition easily into the pertinent matters at hand and not worry about disorganization and safety issues? How is the attitude of employees and what would clients of yours say about you if they were randomly called? Are your sales and profits on the increase and expenses on the decrease? The purpose of the Exit Strategy is to apply a tiny amount of effort in the right direction each day to achieve maximum profit for minimum effort when you do sell. Working on these issues a little bit each day brings huge profit and joy tomorrow. Tax consequences and what you will do with both money and time after the sale is finalized need to be considered. Many times to close a deal you will be asked to help in some capacity with the transition. You want to decide in advance with the help of your tax attorney or CPA how the proceeds of the sale will be best distributed and conserved. The financing arrangements and or cash at closing will greatly affect your tax position and all options should be considered. Can you get more for your business by offering terms on a carry-back note and still protect your interests and save on taxes? Being proactive at this stage will greatly enhance profits at the sale. With your plan laid out and preliminary players like a CPA and a business broker identified, you can now break it down into bite-sized pieces that can be a part of your everyday business routine. This process of implementing little daily routines produces maximum profits at the sale of your business. If your business sells for 10% more due to this organization and planning, you may have just put $10,000, $100,000, $1,000,000 or more in your pocket by simply being prepared. It is my job to orchestrate this process and help you achieve your goal. When the time is right for you to start, I’ll be there to help. Please feel free to call me with questions and or assistance.